In this article, I promised that I would be sending along Four Tips to consider when deciding on the best lawyer for you. I have written about this before in other articles and in my book, Graceful Divorce Solutions, but I’m emphasizing it again because I feel it is so important. Just as there is no “one size fits all” process choice for divorce (collaboration, mediation, litigation), there is definitely no “one size fits all” lawyer for your divorce. The lawyer you choose will depend on the process you hope to use, so that’s the decision you need to make first. Choosing a Divorce Lawyer – Helping or Hurting? This week I had a consultation with a man who has been separated from his wife for more than a year and had just been served with a complaint for divorce. He and his wife have been getting along well over the past year, sharing custody of their teenage son and working out the paying of bills and money issues. In fact, they’ve had a number of good conversations about how they wanted to divide up their assets and debts. They’ve managed to maintain a good relationship and even go out for lunch as a family every Sunday. Comments Off on Choosing a Divorce Lawyer – Helping or Hurting? One of the most important decisions you’ll make when going through your divorce is whether to use a lawyer, and if so, whom to hire. The lawyer you choose can make a big difference in how your case goes. Divorce Lawyers: Hello Noble Profession? Comments Off on Divorce Lawyers: Hello Noble Profession? Divorce doesn't have to be a hideous thing. 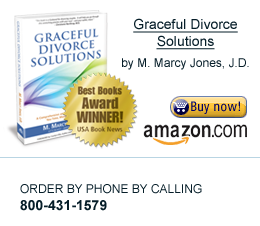 "Graceful Divorce Solutions: A Comprehensive and Proactive Guide to Saving You Time, Money, and Your Sanity" is a guide to happier divorces, something that to many at first sight seems like an oxymoron. Advising readers to remember their family, understand the needs, understand why you're breaking up, and more, "Graceful Divorce Solutions" is a thoughtful read anyone who wants to end their union with less bad blood should consider.